Halloween is still 13 days away according to our dicey math skills. We thought we’d get an obvious spooky cocktail out of the way first. 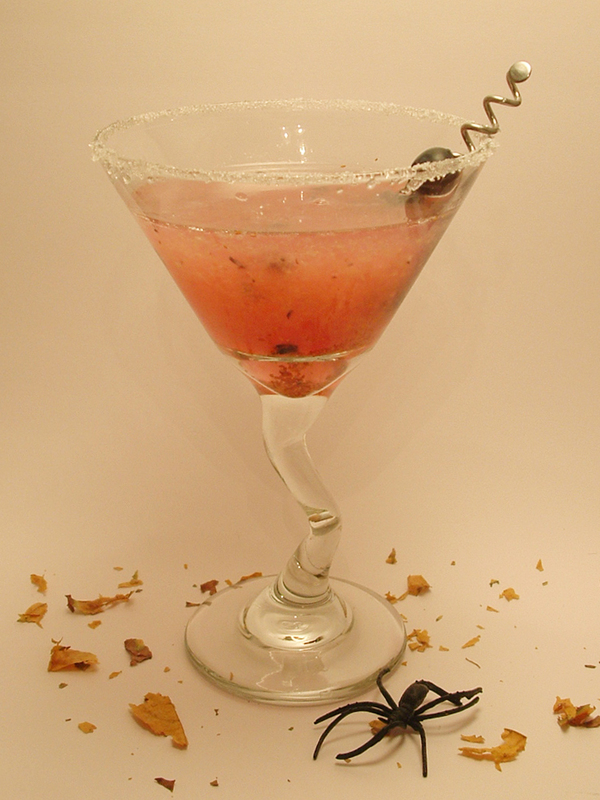 We present the Boo-berry Vodka Martini. We brought home a bottle of the highly aromatic Smirnoff Blueberry flavoured vodka, combined it with a bit of triple sec and some sprite, and garnished it with a few fresh blueberries and a single black spider. Wet the rim of a chilled cocktail glass with lemon juice. Turn the glass in a shallow plate of sugar to cover the rim. Muddle the blueberries and ripped up basil leaves in a cocktail shaker until they are shredded. Take a deep whiff of the beautiful mix of smells. 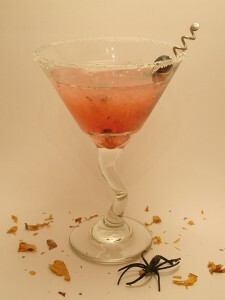 Add the sweet & sour syrup, triple sec, blueberry flavoured vodka, and 4 ice cubes. Shake, then strain into the chilled cocktail glass.